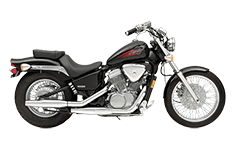 Like many of its Shadow brethren, the VTX VT 600 from Honda is a classically tuned bike with a whole lot of attitude, style and sophistication. Owners wouldn't dare outfit their motorcycles with a cheap pair of saddlebags, and we realize that design and affordability can actually go hand in hand. We've featured the Viking Bags collection of saddlebags specifically for use with the VTX VT 600 motorcycle, and we think you're really appreciate the collection. Don't just take our word for it, though, see for yourself!